Happy weekend crafty friends! I hope you are able to dive into a crafty project this weekend. I had the pleasure of continuing my series with Ariana from The Crafty Ways. We have made it to the purple colors of the rainbow. I really think this one may have been the hardest yet! I don't have a ton of purple in my stash nor do I have any photos that scream that they should be scrapped in purple, but I persisted. I settled on scrapbooking this photo of my cat which had enough neutrals in it that I should swing it any way. So, let's hop in to it! My white cardstock background took some rough mixed media on it. Although I did gesso my paper, it wasn't the highest quality and I did saturate it with water. It's weak and curling at the edges, but it's still alive! I used my watercolors and the packaging technique to achieve this look on the background. If you don't have the color paper you want, why not just create it? I love how it shoes so many different textures while still being flat and workable. You can see some streaks, puddles, and marbling in the background. If you do plan to do mixed media techniques on your background, be sure to have paper towels and a heat gun on hand. Otherwise, you'll have a mess everywhere and you'll be waiting a while for dry time. I used a stencil from the Wild Whisper shop and some gold modeling paste for additional texture. My tutorial is below in this video, but I also have more details to share with you. The hardest part of this layout was the embellishing. I knew that I didn't have a lot of purple in my stash and I could've made some more purple elements, but I wanted to think more outside of the box. I ended up using some wood veneer from Maggie Holmes for my title after I had painted it purple using acrylic paint. I created a cluster around my title piece by first layering a small white doily underneath my title piece. I also layered a small gold patterned tag from Joann's under the right side. I tucked an arrow paper clip from Freckled Fawn to add more emphasis. To complete this cluster, I used sequins designed by Spiegel Mom Scraps for Wild Whisper and some gold sequins. Next, I dove into some washi tape! I have a ton, ton, ton of purple washi tape and I have no idea why. I used one gold washi tape to help ground my layout. I put a long strip at the bottom of my page. I also included a short strip under my title piece (which you can't really see),and a strip under my photo. I layered my photo of my cute cat on some light purple patterned paper from K & Company. This layout is simple, but the purple background really packs a punch! Do you find yourself scrapping with purple often? I know that I rarely use it on my own, but I do like to use it along side of blues and yellows. I hope you have been enjoying this series. Let us know what other type of series you would like to see in the comments! Thanks for stopping by! Hello crafty friends! I have another card to share with you all today which I hope will eventually be part of a series. Essentially, I want to show you how you can mix and match stamp sets to create more custom themes and get more use out of our stamps. This card uses three stamps from three different sets! So, I hope you enjoy and if you would like more renditions of this series please comment down below! As most of my cards do, this one starts off with a base of white cardstock folded in half to be 4 1/4" x 5 1/2" or an A2 sized card. Then, I looked through some of my random 6x6 papers that I haven't used in forever and pulled out these two matching plaid patterns. I cut the blue one to be 4" x 5 1/4" which leaves a perfect white border around the main portion. Then, I used my stitched rectangle dies to cut the green patterned paper and the gray patterned paper to make layers. I offset them for a fun look. Once that was assembled I worked on my little image set here. The front of this card features three different stamps from three different manufacturers! I find it fun to be able to mix and match stamp sets like these ones to get a perfect customized handmade card for the recipient. I used a tree stamp from Mint Owl Studios, the little pup from Mama Elephant, and the sentiment is from Lawn Fawn! I'll try and link all of these stamp sets below so you can check them out. I simply just stamped my images and then colored them in using my watercolors. For the sentiment, I stamped it in VersaMark and embossed it with clear embossing powder to give a darker gray look. To complete the card, I used enamel dots from Michael's Recollections line and from Whimsy Stamps. There are a lot of different products used on this card and I will try to link them all below, if I can find them that is! I hope you enjoyed this fun stamp set combo card! Thanks for stopping by! Hello friends! It's Tuesday, which means that there is a brand new project to share with you all! I have become addicted to making cards. I am trying to use all of the stamps in my "new" section of my craft room before filing them into my storage system. So, I picked up this Unity Stamp Co. set a few months ago and wanted to use it! I started this card by stamping and watercoloring the image. I attempted to pull the color palate from the multicolored patterned paper that you can see on the card, but none of the colors turned out exactly the way I wanted. I still had fun coloring the image. I stamped the sentiment on some colored paper from the same paper pack from KI Memories in black Memento ink. I used my set of stitched rectangle dies to cut out all of my layers. This adds so much detail to my cards and I can't wait to buy stitched circles next! All of the papers on this card are from KI Memories. I decided to put foam behind my main image and sentiment to add more interest. Lastly, I embossed the background using an embossing folder from Cuttlebug. This card was for a dear friend of mine and she really loved it, I hope you loved it too! Thanks for stopping by! Happy weekend friends! I hope you're enjoying your summer so far. I have another brand new scrapbooking layout to share with you and I hope you're excited! This is part of the Color Theories series which you probably gathered from the title, but this week we're featuring blue! If you haven't heard of the Color Theories series before, I'll explain. This is a YouTube collab with Ariana from The Crafty Ways and we decided to do a series we would feature one color per layout. We are going in rainbow order, so there's plenty for you to catch up on if you've been missing out! Let's hop right in to this blue beauty! I started my layout with a bright blue cardstock background. I have slowly realized that this is the easiest way for me to feature a color on a layout. I find that my patterned papers have too many colors in them and didn't suit the challenge well. I really bashed a lot of embellishments that I have been meaning to use on this layout as well. It's a simple layout with lots of tiny layering elements. I started my scrapbook layout with a little bit of mixed media. I used a stencil from Target and some white modeling paste to add a lot of fun texture and movement on the layout. The arrow pattern on the stencil is really what creates the movement, but since I also left some areas not completely filled in, your eye will follow the dwindling pattern all the way across the page. Let's jump right into clusters now! In the top left I used washi tape as a base for my cluster. I also wanted to use some stamps on this layout and thought that this Lawn Fawn cat playing represented my cat well. I simply stamped it and watercolored the image. I used an Elle's Studio cut apart that says "My Favorite People" at the top. I sprinkled some silver glitter enamel dots, wood veneer stars, and blue glitter stars from Freckled Fawn to finish off this cluster. Now to move on to the title cluster! The official title is "play time" which is made out of a Freckled Fawn wood veneer piece and some silver glitter chipboard stickers. I layered my title on a ombre blue tag from Target. Target clearanced out their summer $1 section last year and I went to town when things were on sale for .50! To the left of my title, I layered some puffy stickers from Paper House on to my photo that read "Best Friends". I used a chipboard clock from BoBunny to go along with the title. I used another puffy sticker heart from Paper House to bring in some more white. Lastly for this cluster, I used a Freckled Fawn chipboard word sticker that reads "I. can't. even." which is so cute! In this picture you can tell that my photo cluster is up on foam to give it dimension. The doily tucker under helps tone down the bright blue background. I used a Neat and Tangled stamp set for the "Practically Purr-fect" banner. I included more chipboard and wood veneer stars and enamel dots. I hope you enjoyed this week's Color Theory video! Be sure to check out Ariana's as well! Thanks for stopping by! 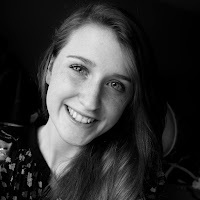 Hi friends and welcome back to my blog! Today I have a unique birthday card to share with. I recently purchased this fun stamp set from an Etsy retailer. It features a fun cake pop theme and I had to use it for my friend's birthday card! I started my main stamped section by using a scrap rectangle of white cardstock and stamping two cake pop sticks. Then I used a 1 inch circle punch to cut out two circles from cream cardstock. These will serve as my cake portion of the cake pop. The stamp set did include a stampable base, but I thought this would add more dimension. Next, I grabbed my ColorBox chestnut roan ink and stamped the icing portion of my cake pops. I was going for the color of chocolate so this color worked beautifully. Once the cake pops were assembled, I worked on the sentiment. I had a scrap piece of polka dot patterned paper from Dear Lizzy that I used to stamp this tag and cut out. I then used the sentiment from the stamp set in black Memento ink to create the cute message! I couldn't leave it plain like that, so I cut a small hole through the tag and added some teak twine. These colors matched perfectly! I finally started layering my card together. I used a beautiful piece of silver metallic paper for the background that has been sitting in my stash for years! It compliments the cake pops and the teal very nicely. This piece is cut to 4" x 5 1/4". This leaves a lovely border around the outside edge to frame the front of the card. I used another piece of the teal polka dot paper as a layer behind my cake pops. Nothing too fancy. However, if I could go back and change anything, I would have used my stitched rectangle dies to get cute borders. Lastly, I layered my cake pop piece and the sentiment tag. To complete the card, I added a couple silver enamel dots from The Paper Studio. I absolutely love how this card turned out and I am sure the recipient will too. I hope you enjoyed this card creation and thanks for stopping by! Hello crafty friends! I have so, so, so happy to be back in my craft room on a semi-regular basis. When I thought of what I was going to do this summer, I knew it would be hard. Having a full time job with a 40 minute commute, plus a full time schedule of classes can be overwhelming at times. Luckily, I have gotten into a little bit of a grove with my videos and creations, so I can have the best of both worlds! Soon enough I'll be done with school and then craft even more! Today, I am sharing a Father's Day card to share with you all. Masculine cards can be hard for me to create. I have a lot of girly items in my stash, so this was a tiny bit harder. It is still a little girly from the scripty fonts and the glitter embossing powder, but I had to! My card starts with a base of 110lb white cardstock cut to 4 1/4" x 11" and folded in half to make it an A2 sized card. I really wanted to add something to the background, but didn't know what to do. Eventually I found this is light brown washi tape and created a background with small strips. It's an easy way to use up that washi and to add more interest! Next, I used two different sizes of my stitched rectangle dies to make the main layers. I cut them out of kraft paper and a piece of patterned paper from DCWV. I wanted to used this new stamp set from Lawn Fawn called "Meow You Doin'". Of course I love this stamp set because it is full of puns! I stamped this cat image using Memento black ink and colored it with colored pencils. I tried to make it look like my cats, but I didn't have the best color. To emphasize this cute kitty I used some chipboard brackets. I was also hoping this would add some more masculinity, but it didn't really. I used a word die from Waffle Flower to create the first section of the sentiment. Then, I used a scrap of the background paper to emboss this beautiful gold portion of the sentiment. "Celebrate mew" is so cute and my father loves puns. I popped the banner up on some foam adhesive for more interest. I used Wow! gold embossing powder for it. Lastly, to decorate the front of the card I used a couple of things. One of these things is so old I cannot even tell you where I got them from. I'm also pretty positive that I have never used any of these miniature white felt stars. I sprinkled them around in different clusters. I believe they were made by KI Memories. I also used enamel dots from Echo Park in two different colors to add contrast. To finally finish the card, I added another sentiment on the inside. This is also from the same Lawn Fawn stamp set. I thought that just the sentiment was a little boring, so I grabbed this little paw print and scattered them around. That finishes it up! I hope you enjoyed this alternative father's day card. It sure was a lot of fun to put together! Thanks for stopping by! Hello everyone! Welcome back! Today we're back with another episode of Color Theories! If you've been following along you would know that we already made it to the green lesson. If you've missed a couple of our colorful lessons check out our playlist! Don't forget to watch Ariana's video after mine! I'll be honest right in the beginning of this post, I had a very difficult time making this green layout. I even picked something that went so well with the green theme! Don't be afraid to go out of your comfort zone and try a rare color in your palate. I decided that perhaps picking something that obviously went with this green challenge would make it easier, it did not. I felt that the green background was hard to match to the green on the Playbill and I didn't want them to clash. I really need to evaluate the greenness of my stash! Below is the process video and I hope you enjoy! So, after realizing that this was going to be very hard, I decided to keep it simple. A lightly textured background to add a little interest without causing distraction ended up working the best. This paper is from the DCWV Spring Stack. I layered a couple of papers behind my main photo from various places. One is from a baby paper stack, the other is plain cardstock. I think that keeping things simple on this page was the right way to go. There were a lot of different sized items to work around which was also hard. I placed a white shipping tag on top of the pocket to make a place for my journaling to live. I decorated it with Tim Holtz stickers and Freckled Fawn enamel dots. I created a small cluster to the right of my photo using various stash bits. The flair piece is from Jenni Bowlin, the star sticker is from Jillibean Soup as well as the tab sticker. I used a wood veneer heart and thread for texture. The title is made out of Heidi Swapp glitter alphabet stickers, a set of Thickers, and a Freckled Fawn wood veneer piece. I wanted this page to be functional and simple so the elements could pop out and shine. I hope you enjoyed this post, be sure to stop by and check out Ariana's page too! Thanks for stopping by! Hello everyone! I was invited to participate in a new tag for card makers created by Multiplicity Crafts! Essentially, everyone fills out the tag and then anyone who reads it should also post and fill it out on some social media or blog post, etc. There's a blog post here explaining all the details and how to enter to win the prize! So, let's jump into the questions! 1.) How long have you been a card-maker and how did you get started? I started card making when I was in elementary school. They weren't the best cards, but they were cute! I got started because of my friends' mom being a Stampin' Up demonstrator. She let us play with her supplies and make things and my parents later bought me some crafting kits. 2.) What are some of your favorite craft stores (bricks & mortar store OR online? One of my favorite online stores is Tupelo Designs they have free shipping in the U.S. on every order! I also love Wild Whisper Designs, Paper Issues, and Hallmark Scrapbook. There's also probably a lot of stores that I am forgetting. I love online shopping! 3.) Is there a particular card-making technique that you want to try but haven’t yet? I just recently tried out a step fold card and would love to learn more styles of those. I realized slowly that there are hundreds of options to choose from! 4.) What craft item/tool do you have a fetish for? Enamel dots are my latest obsession! 5.) What craft product or tool would you recommend to all card-makers? My life has changed after getting a stamping tool. It opens the doors to faster stamping, better images, less mistakes, and I love it! I don't have the expensive version, but the cheaper version works just fine for me. 6.) How long does it normally take you to complete a card? Depending on the card, it can take 20 minutes to an hour. Although, mixed media cards take a lot longer with all of the dry time in between. 7.) How often do you craft? I tried to craft at least three times a week, but soon I hope it will be everyday over summer. 8.) What is your biggest craft splurge item that you purchased or received as a gift? Back in the day, I received a cricut expression which is probably the most expensive crafty gift I have received yet! 9.) What part(s) of crafting do you enjoy the least? I don't like the cleaning up of my mess after it is completed. I wish they would just magically put themselves away! 10.) What part(s) of crafting do you enjoy the most? The thing I like most about crafting is sharing the craft. Whether it is a handmade card or a scrapbook or another item, it is so much fun to share them! I hope you enjoyed learning a little bit more about my crafty life! Find the original post for the tag over at Multiplicity Crafts and join in! We'd love to hear your answers to these questions. Thanks for stopping by! Hello crafty folk! I am back with another monthly wrap up. This is probably the most disappointing month for my creativity, but I have plenty of excuses ;). I wish this past month wasn't so hectic, but I won't bore you with long stories so I'll just share a couple with you. May was the month I concluded my college career (mostly). While I am finishing up my last classes online this summer, I am not going back to school in the fall like my other friends are and I will definitely miss them. So, after a rough couple of finals and moving home, things have been non-stop. I started my new job, started my online classes, and am still adjusting to being back home. I still managed to get a couple of crafty things complete through the chaos. I hope you enjoy this video of my creations! As you saw, my tally in the video included 4 12 x 12 layouts and 11 cards. Some of them I didn't show in the video since I had already given them away. You can find some floral cards here, a fun step card tutorial here, and most of the cards I didn't take photos of. If you check out my Instagram, you'll find more photos there! How are all of you doing on your creations? I know a lot of people don't tally them up like I do, but rather just "feel" like they have done enough for the month or not. Let me know how you did down below in the comment section. Thanks for stopping by! Hello crafty people! 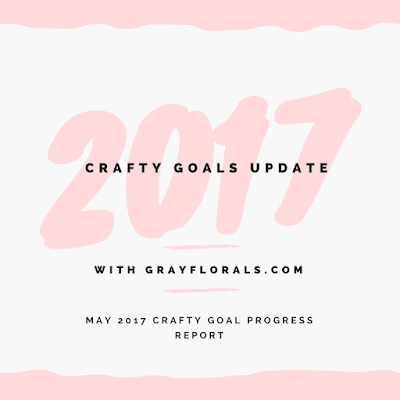 As May comes to an end, another analysis of my crafty goals is here! May has been the biggest whirl wind and I know that I say that often, but a lot has changed this month. This month I graduated from college after being there only 3 years, said goodbye to friends, co-workers, my job, and my apartment mates, and packed up all of my things and moved back home. Then, on the last two days of the month I started my new job and my online classes (only 4 left online before I am officially graduated). June also will hold a lot of big things happening, but until then there's a little life update. I'm happy to be home with my family and my pets, but still sad knowing that I'm not going back to school with my friends in the fall. Looking forward to new opportunities and whatever else lies ahead! Now, as for crafty goals, I didn't get too much completed this month, but now you see why ;). Now that I became officially moved home, I have found one spot for one album! I decided to make this an interchangeable area where I switch out which album is featured whenever I feel like switching them out. I'm still looking for a nice way to store my other albums other than in my craft room. How do you all store your albums? Since having to move all of my things home, including my scrapbooking supplies, the travel albums haven't been worked on at all...whoops! I am looking forward to working on them with all of my supplies at hand and having more desk space! If you guys want a specific YouTube series for the Disney pages or the 6x8 pages I'm working on, let me know. Recently, I got invited to join in on a 40 day spending freeze challenge on Facebook which has been helping. Although, with all of the stress from finals and moving, I may have ordered a couple of things. Plus, I got a graduation present that included attending a Scrapbooking and Cardmaking expo so I had to buy a couple of things! Safe to say, that this is not the month for a spending freeze to happen successfully, but June is looking hopeful! I have been obsessed with new and fun card ideas. My Pinterest boards are practically overflowing with ideas! I have been making more cards this month, which you can see in my monthly wrap up video on my YouTube channel. I also uploaded more card tutorials this month which I hope you're all enjoying! If you would like to see specific types of cards or techniques please let me know. 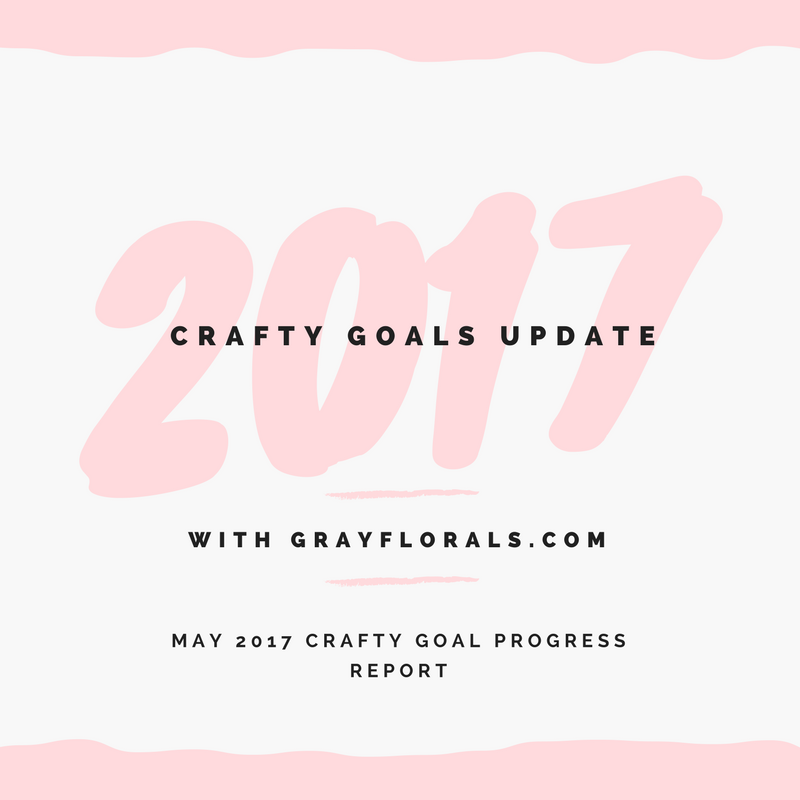 May has not been a super successful month for goal achieving, but I am not going to give up! We're almost halfway through the year, but I still have hope. How're your goals going so far? If you didn't make any goals, it is never too late to start! I hope you enjoy these goal updates. Hello friends! I hope you're excited for another scrapbooking process video! As you know, I am currently collabing with Ariana from The Crafty Ways on a fun series called Color Theories. This scrapbooking video series is all about tackling the rainbow one color at a time. We attempt to create monochromatic layouts featuring a different color of the rainbow every week. This week we are featuring yellow! So, if you haven't seen the rest of our Color Theory lessons yet, check them out in our playlist! We had to take a short break from the series, but we're back and ready to go! Be sure to subscribe to Ariana and I so you can get a video notification every week! Yellow is definitely not my favorite color, nor one that I find often in my everyday life. Luckily, when we were discussing the series, we decided to group gold into this color scheme as well. Below is my process video for this really fun to make layout! This layout features a photo from when we went to see Wicked off broadway. I am still very proud of the title on this layout because it mixes so many fonts and it is a play on words. I used a Thickers set, Tim Holtz tiny letter stickers, and a Heidi Swapp wood veneer word to create my title. I absolutely love the contrast the black brings to this yellow layout. In the background of my layouts I did a little bit of mixed media. This is one of my all time favorite stencils. It is a background stencil actually meant for painting walls by Plaid Crafts. I think this design works for so many different themes and topics as well. I simply used white modeling paste through the stencil to achieve this look. I wanted to have the pattern extend all the way across the page so I realigned the stencil halfway through and continued applying the paste. I kept the matting on my photo minimal. I used white and black cardstock to add more contrast against the dark photo. I wanted something that reminded me of this experience as part of the design elements. We went to see the musical at the Landmark Theater which is a historically beautiful theater with gold walls and ceilings and mirrors and chandeliers and it is so majestic. I scattered various bits around in the opposite diagonal direction of the modeling paste to add more interest. I created a small cluster to the left of my photo using a Freckled Fawn date ticket sticker and a Pink Paislee puffy hexagon sticker. Here you can see the rest of my title. I included some Tim Holtz tiny phrase stickers to add more interest as well. I also included some Echo Park enamel dots in yellow and black. One thing I would like to mention is that if you're doing mixed media like I did where it adds dimension, you'll want to have several adhesives near by. Adhering this Heidi Swapp wood veneer word was difficult, especially since it overlaps the mixed media. In this last photo you can see all of the bit I used in the top right and bottom left sections. 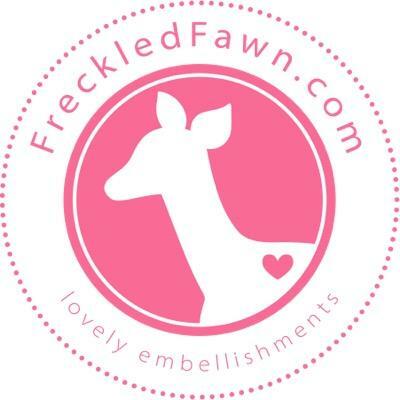 These items include Thickers foam stars, Freckled Fawn chipboard glitter stars, Pink Paislee puffy stickers, Tim Holtz label stickers, gold Heidi Shine splatters, and of course enamel dots. I hope you all enjoyed this video! Please check out Ariana's as well! We'll be back next week to dive into the green color theory! Thanks for stopping by! Hi friends! Is it June already? I can hardly believe we are starting the first month of summer. It feels like it was just winter here. Although the weather is heating up a little, I still find myself wanting to spend time inside in the craft room. I have seen some ladies who like to take their supplies outside and create, but that's not my lifestyle. Anyway, today I have a fun card to share with you all! You might remember in my most recent haul video that I showed you this new stamp set that I won from A Day for Daisies. Well, I finally got the chance to play with it a little and I have so many ideas! My first idea was a simple watercolored panel as the main focus. I took two main stamps, the larger deer and the bunny and stamped them. Then, I used a LePen fine tip marker to create some sketched grass bits as a ground base. The images were then loosely watercolored using my Michael's set. The images in this stamp set are so, so sweet. I highly suggest that you check out the A Day for Daisies store. I wanted to add a little more to this card. It needed a nice sentiment and some more color. I decided that I would use a Lawn Fawn sentiment that reads, "If friends were flowers I'd pick you". I thought this had a cute and whimsy theme like this stamp set. I decided to stamp this and then pop it up on foam adhesive to add dimension. I decorated it with Doodlebug sprinkles in a silver color. Lastly, the main watercolor panel was mounted on to light blue cardstock cut to 4" x 5 1/4". All of this was attached to a 110 lb. white cardstock base. Although simple, I still think this card is beautiful. Sometimes a little watercolor is all you need. Thanks for stopping by!